Spinosaurus made its first film appearance in the critically panned third film of the Jurassic Park franchise, terrorising a group of islanders. It wasn’t a memorable act partly because the movie was so forgettable and partly because the layman’s dinosaur vernacular hasn’t evolved beyond Tyrannosaurus rex and velociraptor. But if it did, we would find that spinosaurus was a remarkable creature, one of the most fascinating predators to have ever lived on Earth (~112-94 million years ago). There is a degree of imagination and informed guesswork involved in palaeontology. Even considering that, the spinosaurus remains an enigma. Its first bones were discovered in 1912, and scientists knew at the time that the fossils belonged to a truly unique dinosaur. It had spines of imposing length on its mid back and its jaw was elongated with long conical teeth, bearing greater resemblance to modern crocodiles than the dominant predators of the time. However, before scientists could report the finding with some certainty, the specimen was lost in a World War II bombing raid. In the next few decades, scientists uncovered species bearing structural similarities to the spinosaurus, in sites peppered across Africa. In palaeontology circles, there was some chatter about spinosaurus’s specialised aquatic lifestyle and fish-eating habits. If this were true, it would make spinosaurus a highly specialised dinosaur, and singularly so. But there was scant evidence for the claim as no new bones of the spinosaurus had been discovered – until 2008. In what can only be described as a stroke of stupendous luck, Nizar Ibrahim, a young palaeontologist, unearthed a cluster of bones belonging to the same species as the one found almost a century ago. In 2014, Ibrahim and a team of researchers published a now-famous paper in the journal Science. Based on CT scans of the recent bones, combined with previous fossils and drawings, the spinosaurus discovered was measured to be almost 50 feet in length, making it the largest known predatory dinosaur, larger even than the famed T. rex. The second claim was the bolder one, and it shook the palaeontologists: spinosaurus was adapted to a life in water. Ibrahim’s spinosaurus is a monster that spent most of its time in the rivers of ancient North Africa, swimming in pursuit of fish and using its impressive sail to intimidate and mark territory. Fossil evidence backs up some of these claims. For example, the spinosaurus did have teeth uniquely suited for snagging fish and dense bones that characterise many semi-aquatic creatures today. The case presented in the 2014 paper captured the imagination of the scientific and general audience alike. 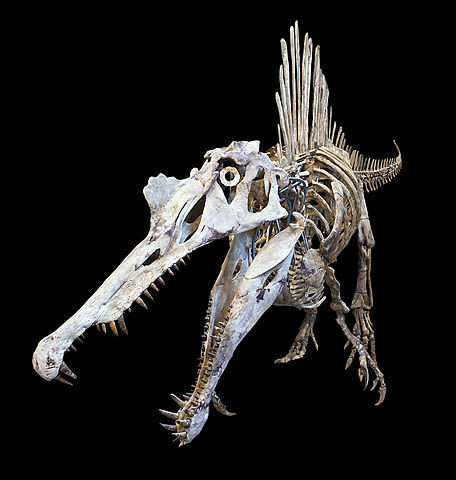 It inspired renewed interest in the degree of spinosaurus’s affinity for water and its intriguing body adaptations. Also read: In ‘Jurassic World: Fallen Kingdom’, Who Are the Real Monsters? But how exactly did the giant navigate the waterways of 95 million years ago? Ibrahim has conceded that’s a difficult research problem: “The details of how the animals moved around the water and caught prey, that’s obviously a trickier part of the scientific research,” he told National Geographic in August this year. Donald Henderson, a palaeontologist at the Royal Tyrrell Museum, Alberta, took a shot at this problem. In a paper published last month in the journal PeerJ, Henderson countered Ibrahim’s claim that spinosaurus led an aquatic lifestyle. His findings indicate that while spinosaurus may have very well survived on a healthy diet of fish and spent time in water, it is far from capable of swimming or diving in pursuit of prey. He concluded thus by dunking a full-sized spinosaurus in water. Using the reconstruction of a complete dinosaur offered in the original 2014 paper, Henderson created a 3D computer model of the spinosaurus – all ‘flesh and bones’, and tested its flotation characteristics and stability in water. The concept of buoyancy dates back to Archimedes and his famous ‘Eureka!’ moment: a body less dense than water will not sink completely but instead float with a fraction of its volume above water. The 3D model of spinosaurus had no problem floating with its head above the water. However, many other dinosaurs are known to be able to float this way, including T. rex and the Baryonyx, so spinosaurus’s ability to float this way might not be special. Henderson also performed a virtual sink test. Most modern-day semi-aquatic animals have an innate ability to completely immerse themselves in water, in pursuit of prey or to scan the river bed. But no matter how hard he tried, the spinosaurus wouldn’t sink, even after radically deflating its lungs – a major hit to its claim of being suited to an aquatic lifestyle. Finally, and perhaps most crucially, Henderson tested the stability of a water-borne spinosaurus. If an animal is to spend a lot of time in water – swimming or otherwise – it should be able to hold an upright posture. However, Henderson found that when slightly tipped one one side, the spinosaurus simply rolled over and remained that way instead of being able to correct itself and or even retaining its posture. 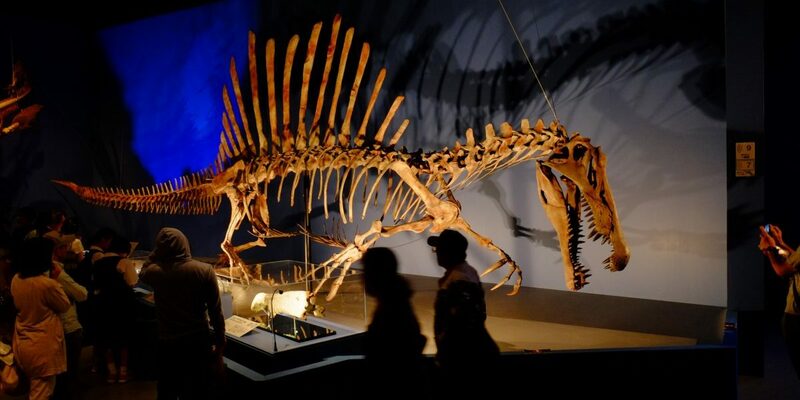 In order to remain upright with such a unstable body type, spinosaurus would have had to constantly engage its limbs, which is a costly action and hardly befitting a well-adapted aquatic animal. Spinosaurus had some unassailable connections with the aquatic ecosystem. Previous studies have provided compelling evidence that it spent a considerable amount of time in water and its diet included a healthy amount of fish. So what Henderson’s study does is temper Ibrahim’s emphatic claim of spinosaurus being an ‘aquatic’ dinosaur and show that its swimming and diving abilities were suspect. In his paper, Henderson also provides evidence that, contrary to previous calculations, spinosaurus wasn’t very front-heavy and could indeed walk on its hind legs like other land-based predators. It could have very well been a competent, if not gifted, terrestrial predator too. Henderson imagines the spinosaurus to be like a grizzly bear, occasionally waddling in water to snag fish but spending time on land as well. And just like that, one of the most enduring debates of modern palaeontology has been reinvigorated. Scientists are on the fence about spinosaurus’s unique tag of being the only water-loving dinosaur, but remain convinced that it is one of the most intriguing creatures – past or present. So here is a dinosaur that may have been a dual ecosystem predator, having the tools to dominate the aquatic niche and also compete on land. It was the largest predator to have ever walked Earth, and one of the largest to have ever existed. It is time to evolve the popular dinosaur vocabulary: consider the spinosaurus.